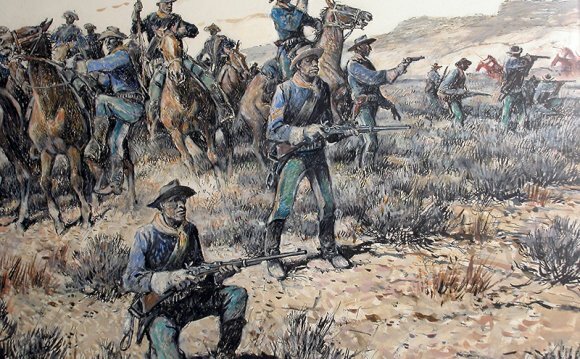 Black soldiers of the Ninth and Tenth cavalry regiments (called “buffalo soldiers” by the Plains Indians) garrisoned Fort Robinson for eighteen years and played an important role in northwestern Nebraska’s history. Organized in 1866, the regiments first served in the Southwest. In 1885 the Ninth Cavalry arrived at Fort Robinson, which was regimental headquarters from 1887 to 1898. The black troopers helped build the new post during the fort’s 1887 expansion and were the first cavalrymen sent to the Pine Ridge Reservation during the Ghost Dance trouble of 1890. Lt. John Alexander, the second African American graduate of West Point, and Henry Plummer, the first black chaplain in the regular army, served here. So did ten buffalo soldier Medal of Honor men. In 1902 the men of the “Fighting Tenth” Cavalry, veterans of the Battle of San Juan Hill, made their headquarters here. Four years later the Tenth helped capture Ute Indians who had fled their Utah reservation, the last military action against Indians on the northern Plains. In 1907 the regiment left for duty in the Philippines. The Buffalo Soldiers were members of the all-black Ninth and Tenth U.S. Cavalry. They were stationed at Fort Robinson during the late 19th and early 20th Centuries. Several notable Buffalo Soldiers, including 10 Medal of Honor recipients, served at the fort. Background While many black men served in the military during the Civil War, the first peacetime all-black units in the regular Army were created by Congress in 1866. The units were a popular place for freed slaves to find work and purpose. These new black soldiers were divided into four (later consolidated into two) regiments of infantry and two regiments of cavalry, the Ninth and the Tenth. The Name The Buffalo Soldiers were given their nickname by their primary adversary, the Plains Indians. There are two competing theories about the origin of the nickname. Some say the soldiers fought with the ferocity of a buffalo; others say the soldiers’ black skin and curly hair reminded the Indians of the buffalo. At Fort Robinson The Ninth Cavalry served in the Southwest, Kansas and Indian Territory (Oklahoma) before coming to Fort Robinson on August 10, 1885. In 1887, the fort became the regimental headquarters of the Ninth. The Buffalo Soldiers were the first cavalry unit sent to the Pine Ridge Reservation during the Ghost Dance trouble of 1890. The “trouble” ended in the Wounded Knee Massacre in December of that year and is considered the last engagement of the Indian Wars. In 1898, the Buffalo Soldiers were sent to the Philippines to fight in the Spanish-American War. After the war, the Tenth Cavalry were assigned to Fort Robinson and remained there until 1907.
Notable Buffalo Soldiers The second African-American graduate of West Point, Lt. John Alexander, and Henry Plummer, the first black chaplain of the regular army, served at the fort. Ten Buffalo Soldiers who served at the fort received the Medal of Honor. Eight of these recipients earned the medal before coming to Fort Robinson, either in Indian Wars or in Cuba; one earned the medal while at the fort; and the last earned his medal in Cuba after being at Fort Robinson. Two of these soldiers, Emmanuel Stance and George Jordan, were buried in the Fort Robinson Cemetery. (All the graves at the Fort Robinson Cemetery were moved to Fort McPherson National Cemetery, near Maxwell, Nebraska, in 1948.) Emmanuel Stance, the first black to win a Medal of Honor after the Civil War, served at the fort from 1885 until his death in 1887. He received his Medal of Honor fighting Kickapoo Indians in Texas in 1870. By the time he reached Fort Robinson, he was a sergeant with a 19-year career behind him, though he had been court marshaled several times. Once at the fort, Sgt. Stance, a strict, almost abusive, disciplinarian, was involved in several incidents with his men. On Christmas Day in 1887, Sgt. Stance’s dead body was found in the nearby town of Crawford. It is believed that he was killed by one of his own men as revenge for his leadership style. Racial Issues The Buffalo Soldiers were often treated badly based on race. When the Ninth Cavalry passed through Hastings, Nebraska, a private was shot twice by a local law official after they got into a dispute. Even though both blacks and Native Americans were oppressed minorities at the time, they were still strong adversaries. The Buffalo Soldiers included many former slaves who wanted to prove their patriotism to the nation while the Native Americans were fighting to keep their homeland. The fact that they were both oppressed by whites did not create any good feelings between them. Buecker, Thomas R. Fort Robinson and the American West, 1874–1899. Norman: University of Oklahoma Press, 2003. Buecker, Thomas R. “One Soldier’s Service: Caleb Benson in the Ninth and Tenth Cavalry, 1875-1908.” Nebraska History. Summer 1993: 54-62. Schubert, Frank N. “Ten Troopers: Buffalo Soldier Medal of Honor Men Who Served at Fort Robinson.” Nebraska History. Winter 1997: 151-157. Schubert, Frank N. “The Violent World of Emanuel Stance.” Nebraska History. Summer 1974: 203-220. Are you looking for Ukraine germany euro 2016 football? The Battle of Bibracte was fought between the Helvetii and six Roman legions, under the command of Gaius Julius Caesar. It was the second major battle of the Gallic Wars.